BAND: We can provide you with a wedding band according to your function and budget. we have a list of performers starting from a duo to a full size band consisting of 8 to 10 members. Musicians have a versatile quality in music dancing also. We use so many brass bands like Trombones, Saxophones many more with superior quality. They are playing melodious music from original Hindi old movie songs as well as new Hindi movie songs. Traditional and western music is performed by team of Master Bulbul Band, Udaipur.The music course is carried out, paralleling with the desire of clients. 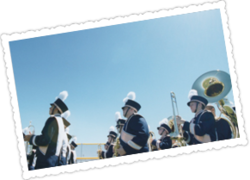 The extensive range of Performing Band Services Instruments along with all its accessories that we supply our clients are special instrument that are played on special occasion of weddings, anniversaries, military service, funerals and festivals.